We guess blackouts and drug-dealing monkeys are all the rage in other parts of the known world. 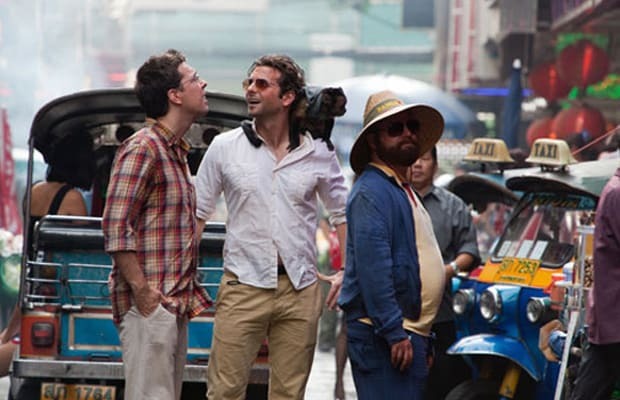 The Hangover Part II&apos;s grossed $265 million globally over the weekend, bringing the unfunny comedy sequel&apos;s worldwide total to $488.7 million. Meaning, the Todd Phillips-directed flick has now surpassed the $467.5 million earned by the original film to become the biggest R-rated comedy of all time. The combined worldwide box-office receipts for both movies now actually exceeds $1 billion. According to The Hollywood Reporter, box office figures in territories like the United Kingdom ($48 million), Germany ($31.5 million), and Australia ($30.4 million) have placed the film high up on the top 10 charts. And to think, it hasn&apos;t even opened either in Spain and Japan yet. Clearly, there&apos;s no accounting for taste anywhere in this world.